Open my lips, O Lord, and my mouth shall proclaim your praise. Create in me a clean heart, O God, and renew a right spirit within me. Cast me not away from your presence and take not your holy Spirit from me. Give me the joy of your saving help again and sustain me with your bountiful Spirit. If anybody does sin, we have one who speaks to the Father in our defense—Jesus Christ, the Righteous One. He is the atoning sacrifice for our sins, and not only for ours, but also for the sins of the whole world. 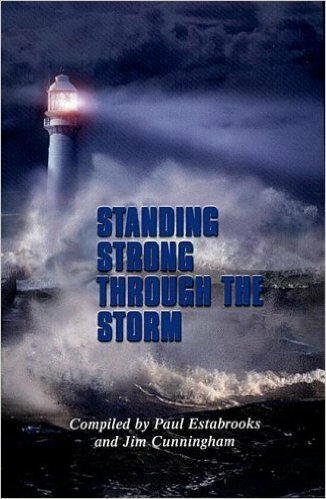 12:1 “At that time Michael, the great prince, the protector of your people, shall arise. There shall be a time of anguish, such as has never occurred since nations first came into existence. But at that time your people shall be delivered, everyone who is found written in the book. 2 Many of those who sleep in the dust of the earth shall awake, some to everlasting life, and some to shame and everlasting contempt. 3 Those who are wise shall shine like the brightness of the sky, and those who lead many to righteousness, like the stars forever and ever. “Beware that no one leads you astray. Many will come in my name and say, ‘I am he!’ and they will lead many astray. "Is Jesus Really Coming Back Or Not?" The Holy Gospel comes to us today from Mark the 13th chapter, beginning at the 1st verse. As he came out of the temple, one of his disciples said to him, “Look, Teacher, what large stones and what large buildings!” Then Jesus asked him, “Do you see these great buildings? Not one stone will be left here upon another; all will be thrown down.” When he was sitting on the Mount of Olives opposite the temple, Peter, James, John, and Andrew asked him privately, “Tell us, when will this be, and what will be the sign that all these things are about to be accomplished?” Then Jesus began to say to them, “Beware that no one leads you astray. Many will come in my name and say, ‘I am he!’ and they will lead many astray. When you hear of wars and rumors of wars, do not be alarmed; this must take place, but the end is still to come. For nation will rise against nation, and kingdom against kingdom; there will be earthquakes in various places; there will be famines. This is but the beginning of the birth pangs. Dear Heavenly Father, you have blessed us with the gift of life and all that is needed to sustain us from day to day, but we are often unappreciative. You have revealed the depth of your love for us, through the life, death and resurrection of your Son, Jesus the Christ, yet we often fail to share your love with others. Through our baptism, you have claimed us as children of your kingdom, and heirs of eternal life, yet we often fail to express our gratitude for your gift of grace. Through the power of your Holy Spirit, move us to deeper faith, and empower us to live our lives in thanksgiving. We ask this in Christ’s name. Amen. In the words of today’s text there is a great sense of urgency. These words of Jesus are very important words, because it was just a few days or not many hours before he would be crucified on the cross. When Jesus was crucified on the cross, the disciples would struggle with what to do next. In these words in our text the Lord Jesus wanted them to focus their attention: not on the things around them that they had seen, but on the spiritual things that would give them strength. 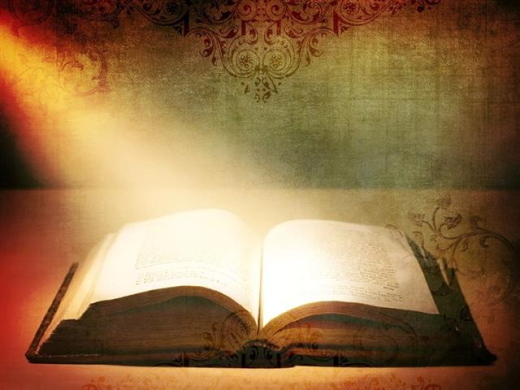 Jesus wanted the disciples to focus on the power of God’s holy word. If I were to hand out confidential voting papers on which you can vote either ‘Yes’ or ‘No’, I wonder what the results would be. You want to know what the question is, don’t you! 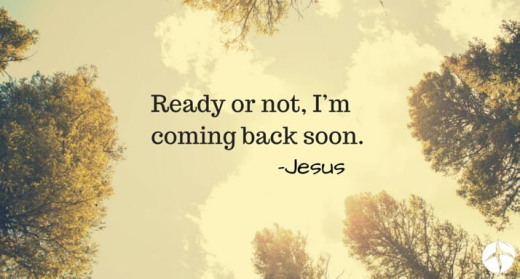 It’s this: Is Jesus really coming back or not? Yes or no. Mark chapter 13 is not easy to understand, and I do not claim to understand it fully. However, the words of Jesus in chapter 13 tell us very clearly about the time leading up to his return, even if some of the details are difficult to make complete sense of. The Jewish Historian Josephus tells us that the Temple at the time of Jesus was a Wonder of the World. Some of its stones were 40 feet long, 12 feet high and 18 feet wide. The front of the temple was covered in plates of gold. When the sun rose the plates reflected back a fiery splendor, so fierce that people were forced to turn their eyes away, just as we are when faced with the sun in our eyes. It was a truly amazing sight. Jesus’ reply is that every stone of that magnificent Temple will be thrown down. The building symbolizing the pride of the nation is going to be destroyed; and indeed it was destroyed around 70AD by the Romans; but when Jesus spoke these words around 40 years before the destruction of the Temple, he gave no dates. What he did give were warnings about future persecutions, warnings about false teachers, and encouragements to watch and wait for the Son of Man to come with great power and glory (13:26). These words of Jesus come just a few days before his crucifixion. There is a sense here of Jesus preparing his disciples. 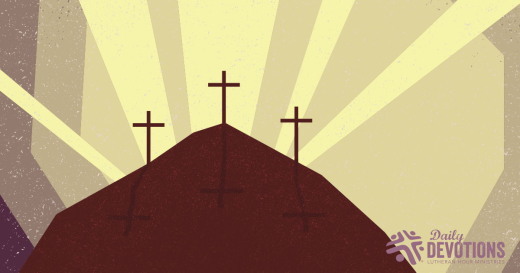 Good Friday was to be a bleak, bloody, bereavement experience for the disciples. 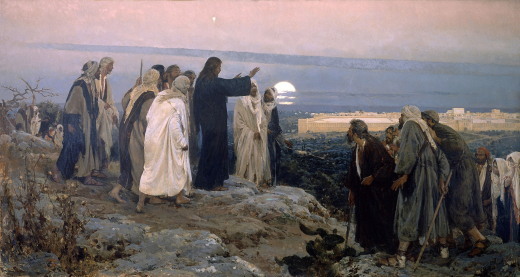 Easter Sunday was to be a day of joy and jubilation in their journey of faith, but after Jesus ascended into heaven, and even after the gift of the Holy Spirit, awful days of persecution were to come before the return of the Son of Man. I wonder where you are today in your journey of faith in Jesus? There was a sense of preparation in Jesus’ words because he is talking about a variety of things to come, many of which Christians are experiencing today. Muslim converts to Christ often know exactly what it means for a brother to betray his brother to death and a father his child (13:12). Mark 13 calls us to have a long term, even eternal view, of events on earth; and not a short-term view. So, how can we turn our attention to the long term, and avoid getting too focused upon the short term? During the whole of the chapter Jesus issues clear advice about how we should react to events, so as to help us keep a long-term perspective. (13:5), “beware that no one leads you astray.” In other words take care not to be fooled by false teachings, and there are false teachings at work in the national church today. (13:7), “When you hear of wars and rumors of wars, do not be alarmed.” Wars are awful. They are horrible; but they must not draw us into thinking that God has withdrawn from his world. The Son of Man will return “with great power and glory” (13:26); and “he will send out the angels, and gather his elect from the four winds, from the ends of the earth to the ends of heaven” (13:27). Later in the chapter are calls to be steadfast in our faith: Jesus says “Do not worry beforehand about what you are to say” (13:11); and “the one who endures to the end will be saved” (13:13). 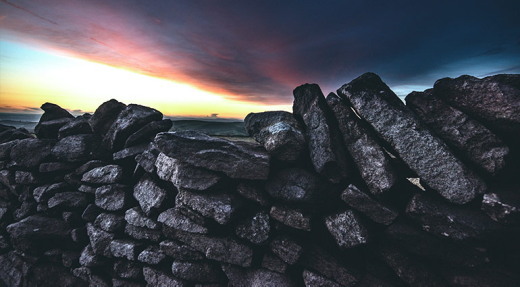 So when our circumstances shift from comfort to discomfort; when our world moves from certainty to uncertainty; and when perhaps even friends and family turn against us, these are not reasons to reject God or to cease to believe in him. They are the opposite. They are times to remind ourselves that Jesus predicted these events. They are times to stand firm. 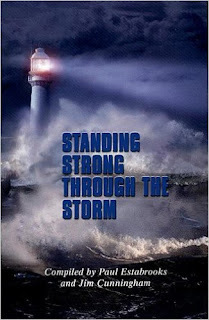 Another theme running through the whole chapter is that of being alert and watchful. Verses 5, and 9 “beware”, verse 23,"be alert", verse 33, “keep alert”, and verses 35 and 37, “keep awake”. Is Jesus really coming back? He said he will! He is coming back. It won’t be like the return of Doctor Who and not even like the Return of Superman, but Jesus is coming back. Before that day, he’s told us what to expect. Jesus calls us to be alert, and not to worry even if circumstances are awful. Lord, our God, help us to prepare for the coming of Christ your Son. May he find us waiting, eager in joyful prayer. Grant that we may be ready to receive Christ when he comes in glory and to share in the banquet of heaven, where he lives and reigns with you and the Holy Spirit, one God, for ever and ever. Amen. This sermon encourages us to watch, to wait, to be alert, to be on our guard, and not to worry. This is an encouragement to remember and believe that Jesus will indeed return with great power and glory, and to remember it whatever our current circumstance. Dios mío, gracias porque permites cambios en mi vida y conoces mi necesidad. "Awake, O Sleeper, Rise from Death"
"Awake, O sleeper, rise from death, And Christ shall give you light; So learn His love, its length and breath, Its fullness, depth and height." Today's hymn paraphrases Ephesians 5:14, "Therefore it says, "Awake, O sleeper, and arise from the dead, and Christ will shine on you." Some scholars think that Paul is quoting an early Christian hymn here -- something the young churches might have sung when they met together. Clearly, they needed to remind themselves of Jesus' light just as we do today! It's a dark world we live in -- a world full of temptation and evil. We struggle to live our lives as Christians, and sometimes we go astray. Most temptations are not the great, obvious ones. We may never have been seriously tempted to murder or commit adultery or worship an actual idol. But can we say the same about common sins like gossip and backbiting? Have we never repeated a juicy rumor, even though we knew it was harming a friend's reputation? Or what about quarreling and refusing to forgive other people? It only takes a moment for a difference of opinion to turn into a nasty argument. We stomp away, vowing we will never speak to that person again. And so, a friendship is lost, a marriage is soured, a church is divided. The darkness creeps in. We need light. We need a light that can light up all the dark spots in our lives, all the shameful, guilty places where we have strayed away from Christ. The hymnwriter reminds us that Christ's love shines through the darkness into our lives. "Awake, O sleeper, rise from death, And Christ shall give you light!" The Holy Spirit calls us back to Jesus -- back to the One who suffered, died, and rose again for our sakes. He took all our sins on Himself and destroyed all our darkness with His own glorious light. Now we, too, can live in the light. No matter how long we have run away from God nor how far our running has taken us from Him, His light will reach us and lead us back to Him. His light can light up the deepest, darkest place in this world. As we come into God's light, we begin to reflect it. As Paul explains, "For God, who said, 'Let light shine out of darkness,' has shone in our hearts to give the light of the knowledge of the glory of God in the face of Jesus Christ" (2 Corinthians 4:6). God begins to shine through us, making us light-filled witnesses to Jesus' love. Then the dark world around us can see the light that dispels the darkness: Jesus, our Savior. May God keep us with Him forever. THE PRAYER: Almighty Savior, send the light of Christ into my heart. Fill my heart with love for You. Keep me safely in Your love. Amen. This Daily Devotion was written by Ruth Ann Brinkmann and Dr. Kari Vo. It is based on the hymn, "Awake, O Sleeper, Rise from Death." Use these devotions in your newsletter and bulletin! Used by permission; all rights reserved by the Int'l LLL (LHM). It's a dark world we live in -- a world full of temptation and evil. Notre Pain Quotidien - Ne cessez pas de bâtir ! Ne cessez pas de bâtir ! Quand on lui a donné la possibilité de jouer un nouveau rôle au travail, Simon a cru qu’elle lui venait de Dieu. Après avoir prié et sollicité des conseils à ce sujet, il a eu le sentiment que Dieu voulait ainsi l’amener à assumer de plus grandes responsabilités. Tout tombait en place, et son patron l’appuyait dans ce changement. Puis les choses se sont mises à mal tourner. Certains de ses collègues lui enviaient sa promotion et lui refusaient leur collaboration. Il a alors commencé à se demander s’il devait baisser les bras. Lorsque les Israélites sont retournés à Jérusalem pour y rebâtir la maison de Dieu, leurs ennemis ont voulu les intimider et les décourager (ESD 4.4). Les Juifs se sont d’abord interrompus, mais ont repris la construction après que Dieu les y a encouragés par les prophètes Aggée et Zacharie (4.24 – 5.2). Lorsque leurs ennemis sont revenus les harceler, les Israélites ont toutefois persévéré, sachant que « l’œil de Dieu veillait sur [eux] » (5.5). Ils se sont attachés aux instructions divines et ont cru que le Seigneur les ferait triompher de toute opposition. Or, Dieu a incité le roi de Perse à soutenir la construction du Temple jusqu’à la fin (V. 13,14). 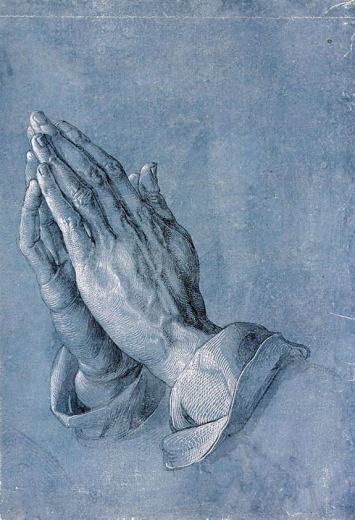 De même, Simon a demandé à Dieu de lui accorder la sagesse de discerner s’il devait garder son emploi ou s’en trouver un autre. Fort de sa conviction de devoir persévérer, il a fini par gagner ses collègues à sa cause. Là où Dieu nous place et quelle que soit l’opposition à vaincre, continuons de le suivre avec fidélité, car il nous conduira à bon port. Restez ferme, car l’œil de Dieu veille sur vous. Quand on lui a donné la possibilité de jouer un nouveau rôle au travail, Simon a cru qu’elle lui venait de Dieu.